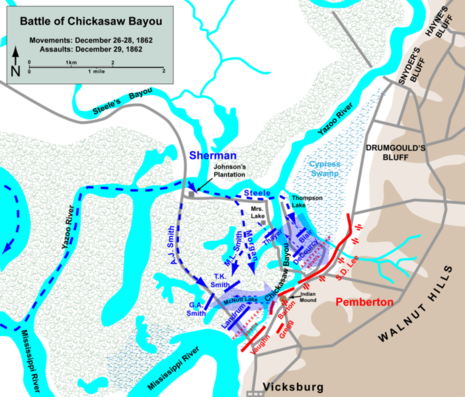 The Battle of Chickasaw Bayou, also called Walnut Hills, fought December 26–29, 1862, was the opening engagement of the Vicksburg Campaign during the American Civil War. Confederate forces under Lt. Gen. John C. Pemberton repulsed an advance by Union Maj. Gen. William T. Sherman that intended to lead to the capture of Vicksburg, Mississippi. On December 26, three Union divisions under Sherman disembarked at Johnson's Plantation on the Yazoo River to approach the Vicksburg defenses from the northeast while a fourth landed farther upstream on December 27. On December 27, the Federals pushed their lines forward through the swamps toward the Walnut Hills, which were strongly defended. On December 28, several futile attempts were made to get around these defenses. On December 29, Sherman ordered a frontal assault, which was repulsed with heavy casualties, and then withdrew. 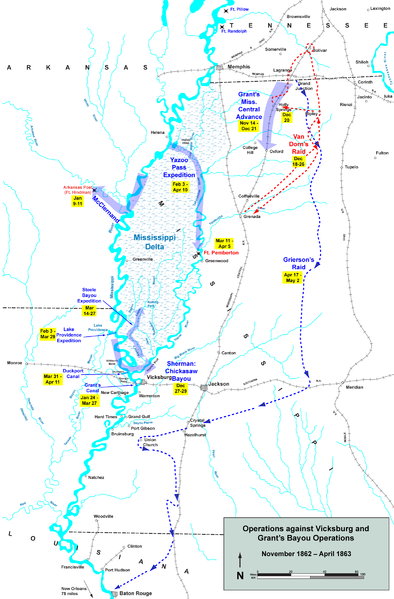 This Confederate victory frustrated Maj. Gen. Ulysses S. Grant's attempts to take Vicksburg by direct approach. Description: On December 26, 1862, three Union divisions, under Maj. Gen. William T. Sherman, disembarked at Johnson's Plantation on the Yazoo River to approach the Vicksburg defenses from the northeast while a fourth landed farther upstream on the 27th. On the 27th, the Federals pushed their lines forward through the swamps toward Walnut Hills, which were strongly defended. On the 28th, several futile attempts were made to get around these defenses. On December 29, Sherman ordered a frontal assault which was repulsed with heavy casualties. Sherman then withdrew. This Confederate victory frustrated Grant's attempts to take Vicksburg by direct approach.